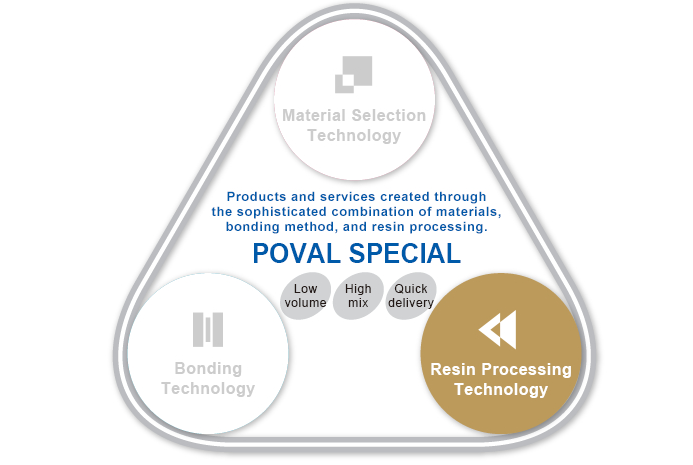 Resin Processing Technology｜Main Technologies｜Our Technology｜POVAL KOGYO CO., LTD.
Our customers make diverse requests, including the addition of hydrophilic or water-repellent properties, processing into special shapes, and mounting. Our skilled craftsmen use their store of expertise and specialized machines to create products that thoroughly meet each and every request. We employ optimal cutting technology that uses cutting tools made in-house. We use grinders and other tools to shave materials down to the intended shape and thickness. We make flat materials into rings. We give the intended hardness to nonwoven fabrics, synthetic leathers, and other materials. We give materials capabilities that they did not originally have, according to the intended purpose. We prevent fibers on the edges of belts from fraying. We print designs and marks, and other items. We increase the strength by sewing. This stops the belt from meandering and prevents items being carried from falling off. When the needed measurements are not available, we lengthen belts with connections. We treat raw materials to create different materials. We shave and polish without making blemishes. We detach the surface of two materials attached to each other.